To Cite: Nordquist J. Improving Health Professions Education: The Educational Trinity, Strides Dev Med Educ. Online ahead of Print ; 15(1):e89058. doi: 10.5812/sdme.89058. Health professions education must be relevant to and keep pace with the development of society, in general; being relevant is to provide for new well-trained health care workforce. Quality of training programs must be of the highest possible standard to guarantee safe independent practice. Institutions around the world are constantly struggling to stay relevant. The fast technological development, new drugs, and therapies set a high pace in constantly monitoring and improving educational offerings. Educational improvement can be analyzed as an educational trinity consisting of curriculum, faculty, and physical space. However, physical space is often neglected, forgotten, and simply not even considered a factor to care about. Nothing could be more wrong. Let me develop this argument. 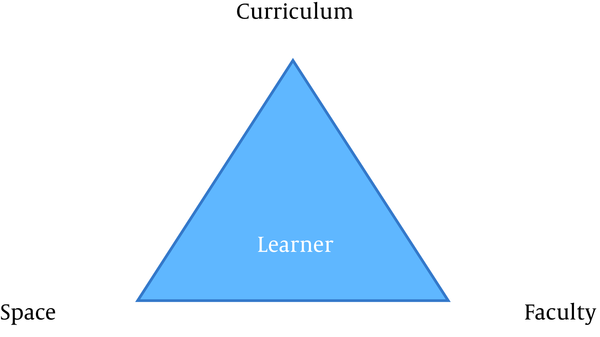 In the center of the educational trinity have we the individual learners (Figure 1). Curriculum has many definitions but in an extended meaning, it includes content, how the content is structured (discipline-based, organ-system-based, problem-based, etc. ), educational methods, educational technology used, assessment approach, and quality improvement system. In the domain of curriculum, we see currently a massive amount of research and innovation globally (1, 2). Faculty includes the teachers, clinical and non-clinical. Faculty members need to master the content, technologies, and educational methods, as well as understand and apply assessment methods prescribed by the curriculum. Physical space is the arena within which organized teaching takes place – the front stage of learning. Physical space is also an important arena for the informal interaction between learners – the backstage of learning (3-5). Efforts to improve education can cause a significant amount of resistance within the faculty. Even after a decision has been made, there are still lots of work to do. Faculty members need to be motivated to implement changes and they need also to understand how to do this in practice. If overlooked, this will cause major implementation gaps between the intended reform and the actual practice (implementation deficits). High-quality faculty development is one remedy for this if properly recognized and properly run (2, 6). If there is limited awareness of the need for high-quality faculty development, there is almost no awareness of the need for the factor of physical space in educational reform (7, 8). If an institution of health professions education is intended to introduce new educational methods, such as team-based learning or problem-based learning and a flipped approach to learning, this makes significant implications for the design of physical space (8). On a classroom scale, space must be designed so that learners can, for example, see each other in order to discuss. One can perhaps claim that this also works in traditional lecture halls where students are seated into narrow rows facing the lecturer; but without any doubt, it will be much more demanding than in a space designed; so, students can see each other face-to-face rather than face-to-neck. A blended approach with flipped classrooms implies that students have to watch videos and work with materials available online outside their classroom schedules. What physical spaces do we have to offer students for this requested, but still informal, learning? Where are the social study spaces, apart from, perhaps, some libraries that will be insufficient? A significant number of medical schools around the world are still built with a “monologue” approach to learning, completely ignorant of current curriculum developments. Social spaces often are completely neglected or designed in a very uninviting, anemic way. Hence, many “new” buildings are in reality nothing else than modern relics of a long past time. This may have many reasons but to some degree, there is general space blindness in educational improvement (8). Physical space has been seen for a long time as a neutral backdrop, not worth serious attention. There is currently an emerging shift towards a more socio-materialistic approach to space, highlighting the importance of physical space and its part in the educational trinity (9-12). The pace of educational reform will be even faster in the future driven by improved technology, new bio-medical discoveries, drugs, and therapies available. The awareness of the interrelations of the three aspects of curriculum development where physical space has been, and still is, underrecognized must change. The educational trinity is a perspective on educational reform in order to keep us relevant today and tomorrow. 1. Frank JR, Snell LS, Cate OT, Holmboe ES, Carraccio C, Swing SR, et al. Competency-based medical education: Theory to practice. Med Teach. 2010;32(8):638-45. doi: 10.3109/0142159X.2010.501190. [PubMed: 20662574]. 2. Holmboe E, Durning S, Hawkings R. A practical guide to the evaluation of clinical competence. 2nd ed. Philadelphia: Elsevier; 2018. 3. Hawick L, Kitto S, Cleland J. Curriculum reform: the more things change, the more they stay the same? Perspect Med Educ. 2016;5(1):5-7. doi: 10.1007/s40037-016-0252-x. [PubMed: 26820747]. [PubMed Central: PMC4754220]. 4. Nordquist J. Alignment achieved? The learning landscape and curricula in health profession education. Med Educ. 2016;50(1):61-8. doi: 10.1111/medu.12844. [PubMed: 26695466]. 5. Hawick L, Cleland J, Kitto S. 'I feel like I sleep here': How space and place influence medical student experiences. Med Educ. 2018;52(10):1016-27. doi: 10.1111/medu.13614. [PubMed: 29932224]. 6. Nordquist J, Grigsby RK. Medical schools viewed from a political perspective: How political skills can improve education leadership. Med Educ. 2011;45(12):1174-80. doi: 10.1111/j.1365-2923.2011.04085.x. [PubMed: 21995564]. 7. Nordquist J, Laing A. Designing spaces for the networked learning landscape. Med Teach. 2015;37(4):337-43. doi: 10.3109/0142159X.2014.1001349. [PubMed: 25655659]. 8. Nordquist J, Sundberg K, Laing A. Aligning physical learning spaces with the curriculum: AMEE Guide No. 107. Med Teach. 2016;38(8):755-68. doi: 10.3109/0142159X.2016.1147541. [PubMed: 27008030]. 9. Fenwick T, Edwards R. Considering materiality in educational policy: Messy objects and multiple reals. Educ Theory. 2011;61(6):709-26. doi: 10.1111/j.1741-5446.2011.00429.x. 10. Fenwick T. Responsibility, complexity science and education: Dilemmas and uncertain responses. Stud Philos Educ. 2008;28(2):101-18. doi: 10.1007/s11217-008-9099-x. 11. Fenwick T. Sociomateriality in medical practice and learning: Attuning to what matters. Med Educ. 2014;48(1):44-52. doi: 10.1111/medu.12295. [PubMed: 24330116]. 12. Mulcahy D. Assembling spaces of learning ‘in’ museums and schools: A practice-based sociomaterial perspective. In: Ellis R, Goodyear P, editors. Spaces of teaching and learning: Integrating perspectives on research and practice. Singapore: Springer; 2018. p. 13-29. doi: 10.1007/978-981-10-7155-3_2.